Two JCM 800 heads were used during the 90's, acording to guitar geek. According to Dave Amato in this Premier Guitar Rig Rundown at (11:40), the REO Speedwagon guitarist has 14 Marshall JCM 800 2210 amps. In this picture from early days of Metallica, we can see Kirk and James playing through their Marshall JCM 800 heads. In this Q&A with Seymour Duncan, Alex Skolnick was giving answers to fan's questions. One fan asked him what gear he had used on a record: > **Rich Walter**: What equipment did you use to record with on the “The New Order”? The tone (especially leads) is SICK! > **Alex Skolnick**: Rich, that was an old *Marshall*, I think *JCM 800*, with a tube screamer. Also, I’d just gotten an ADA MP1 pre-amp and may have used that, but I don’t remember. In this interview with Guitarworld, Alex talked about his gear on previous albums. He mentions a 100W Marshall JCM 800 he used on " Power Windows" and " Hold Your Fire" albums. > The amp setup was a couple of Dean Markley 2x12 combos, two Marshall 2x12 combos, two Marshall 100-watt JCM800 heads and two 4x12 cabinets. > > I had gotten rid of all my Hiwatts and the Dean Markleys and was using primarily Marshalls again. I used 2x12 combos as well as the JCM800. "I’ve been playing through a Marshall JCM 800 half-stack, plugged into the low-sensitivity input and with the tone set up to be big, fat, clean and twangy"
amp was used onthe self titled album. 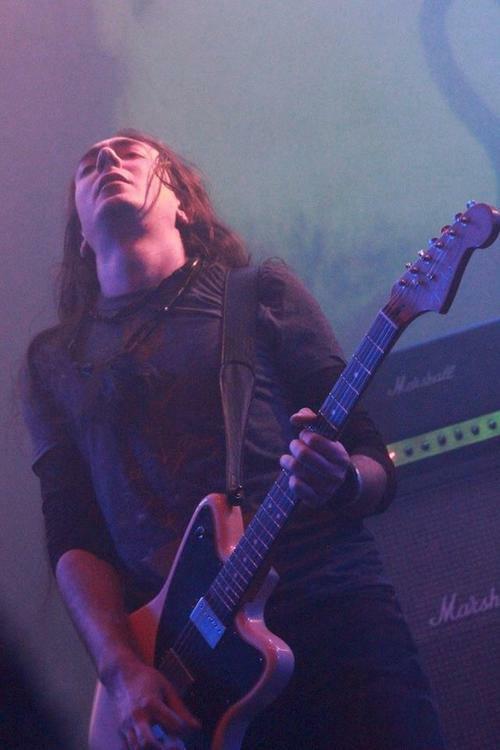 "I have almost exclusively used Marshall amps, but now I also use ENGL amps for stage work. I used Regular Vintage 50 and 100 Watt Marshall heads without a master volume until 1982, when the JCM 800 head was developed. I then used the JCM 800 with Rocktron pre amps as well. Currently I use one of three or four racks which include ENGL pre and power amps, Marshall 9100 poweramps and cabs with the addition ENGL backless cabs." Chris' JCM 800 is mentioned as being a good amp that he uses for boosting rather than colouring. The version he has is a 1996 limited edition series. On this photo Jeff Healey plays a Marshall JCM 800. (on the album REvolution) for the solos, I used the Bogner and a Marshall JCM800 (vertical jack) that was modified by John Suhr. 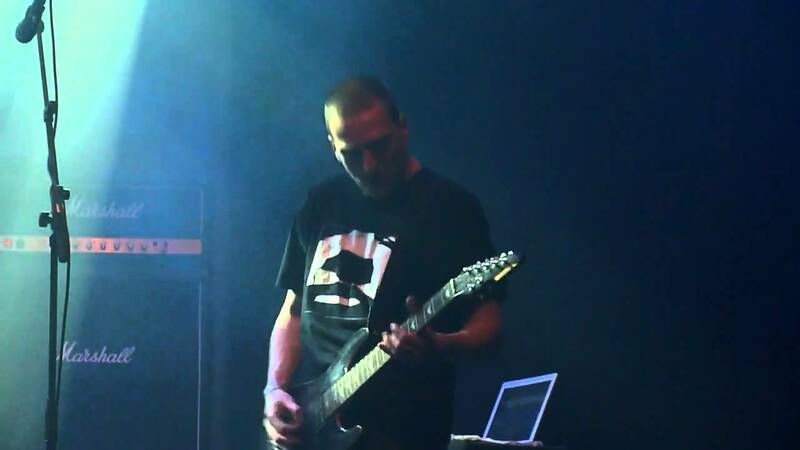 In the official music video for Curb Crusher by Killer Be Killed we can clearly see Greg Puciato playing into a Marshall JCM 800 live. This can be visually confirmed at 2:55 into the video. "For amps, I use the master-volume 100-watt Marshall JCM 800..."
This is a picture from the Chainsaw Charlie tour era showing Chris posing with his JCM 800. That is surely a JCM 800, what I'm not sure of is if it's the Lead Series or the Bass one. On the official Quo website it states that Rossi uses a Marshall JCM 800. At the 25:44 minute mark Lloyd (Rick's guitar tech) shows how Quo use the JCM for live shows. According to Marshall's website, O'Keeffe uses the Marshall JCM800 2203 amplifier head. At 00:54 into the video we can clearly see Chuck using a JCM 800 stack. "The Marshall head i use is very specific, can't get my tone with anything else, it's an ancient Marshall JCM800, and i use specific EQ settings"
We can see at 1:35 that he uses a Marshall JCM 800.. This is one of his heads that he uses. According to [this interview (transcribed from the February 1998 issue of *Guitar Player* magazine)](http://www.oocities.org/sunsetstrip/backstage/1076/article2f.html), Kevin utilized a Marshall JCM-800 during the recording of Third Eye Blind's self-titled debut album. It can be seen that Courtney uses the 2203 right about the 3:00 minute mark. She's plugged into it and the sound of the recording sounds like a Marshall JCM 800 2203 playing. According to [this](http://www.guitargeek.com/adam-franklin-swervedriver-guitar-rig-and-gear-setup-1998/) Guitar Geek rig diagram, Adam uses a Marshall JCM 800 amp. According to this article about gear seen being used by Lockett Pundt, he has used a Marshall JCM 800 100w amp head. On this article, Kiko says that he has a Marshall JCM 800 at home. "My guitar rig from the 12-26-14 Stuck Mojo Reunion Show, photographed at soundcheck." In this video you can see with Deryck Whibley a possible JCM 800 in the minute 0:37. Used in the studio as seen in the photo. What stands behind him is clearly his JCM 800. 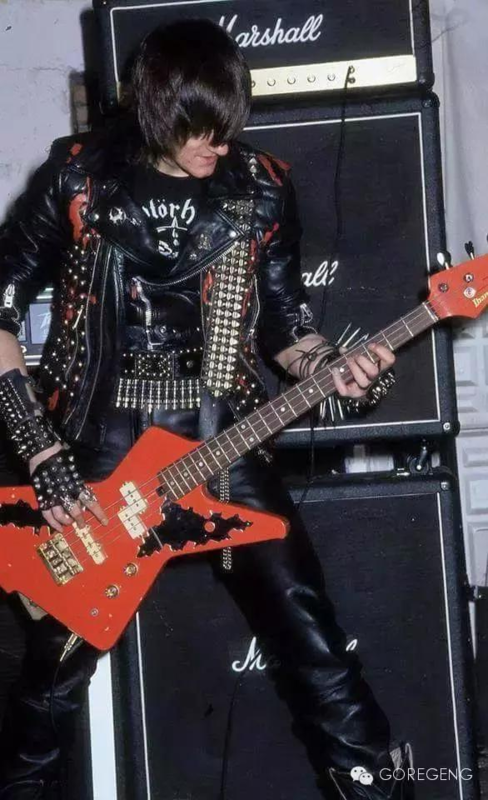 He used it in Hellhammer, throughout Celtic Frost and I believe he's still using it in Triptykon, although I'm not sure. Jo: We use exactly the same gear for recording and live ? both guitars use Marshall 9010 power amps with Boss GX700 effects units, Marshall 4x12 cabs. I used to use a Marshall 800 series guitar amp and overdrive it, but now I use a Peavey T-Max bass head and Laney 2x15 cabs. Picture of Erik using his JCM800 in his studio. He has also featured his JCM800 on his videos from Godlyke Distributing calling it his "baby" and saying "i always use my jcm800". You can see it throughout the linked video and here (the full live performance link): https://www.youtube.com/watch?v=F4w8E0H_sQQ. I guess it's a 2203 but it could be a 2204 as well. 43 seconds into Helga Lost Her Head you can see it's an horizontal inputs version, though. You can clearly see him pick up his guitar off of what looks to be a Marshall amplifier before he starts playing. The name might be ducktaped over but it is pretty obvious. I am unsure if it is the 2203 version or the 2204 version. Charlie describes his JCM800 at 8:30 in the video. The amp head can be seen on the right side of the picture, and appears to be a 2203 model of a JCM 800 because the two instrument cable inputs are horizontal instead of vertical, as the 2203 reissues are. If you pause at various place for example: 13.44, you will see the Marshall he used live for this show, I have no clue if he owns this one or not, but he used it live. Dan's JCM 800 can be seen at 12:58 of their rig rundown. "Right now I'm using a Marshall JCM-800. It's from the brief period when Marshall was switching production from the JCM-800 to the JCM-900, so although it's basically an 800, it's a two-channel amp, which they only made for a little while. I think the gain is a little bit darker sounding, a bit moodier than either the 900 or the 800." "My amp is a Marshall JCM 800, and I use these unbelievably powerful, handmade custom cabs from EarCandy in Indiana. The frequency range is stunning. Every note is totally articulated. There’s bottom-of-the-barrel growl, but throw in a high note, and it’s super clear." 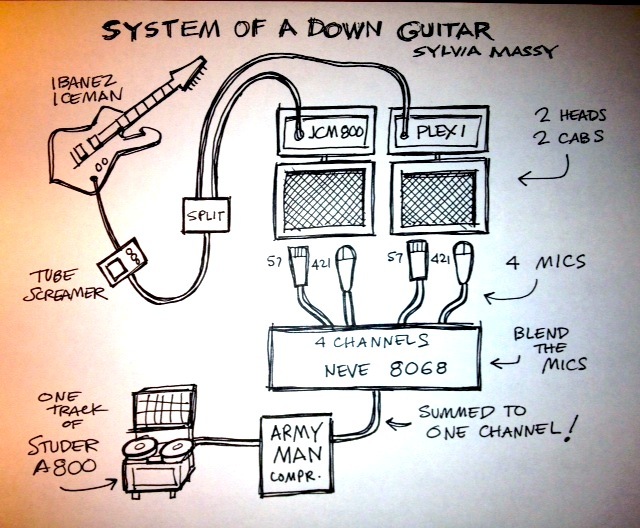 In this diagram from, guitargeek, Papper used JCM 800 amp head. One is on while the other one is for backup. At 2:20 in the video, Gravy says he used Marshall 800 head for the early days of Mushroomhead. 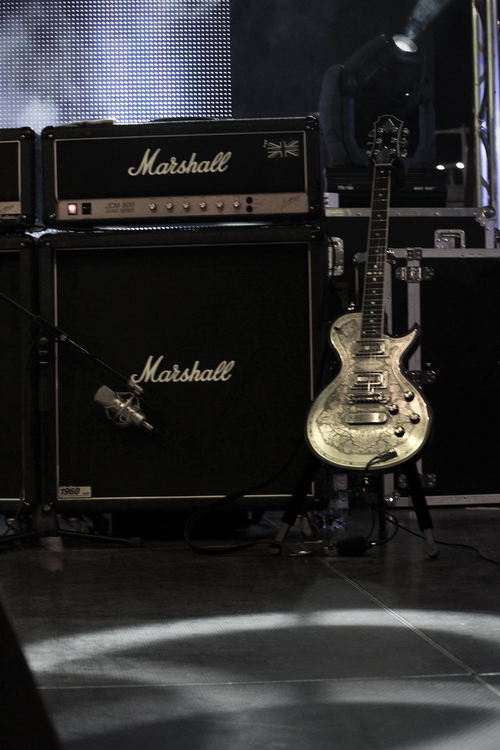 on the official Marshall website, Simon is an endorser, and talks about his JCM 800 head. "Mine came from Buired Alive that came from Snapcase that from Sick of It All." "On The Fanciful I played Marshall JMP’s and JCM800s"
That seems a JCM 2203. Jake talks about his Marshall JCM 800 head at 46 seconds into the video. "A very fun morning in the office"
I shoot a signal in stereo: one in Marshall that provide tight overweight. Second in Peavey for pure sound. In Premier Guitar's Rig Rundown of Citizin, Nick Talks about his Marshall JCM800 that he bought from a friend when he was in high school. They both used these as shown throughout this concert, made in the mid-1980's. 1:13 is a good view but you can see them throughout, these were mid 1980's models and Bad News were a mid 1980's band, no real concrete proof it was these amps but there isn't much to go on. At 4:10 Mathieu talks about his amp and mods. 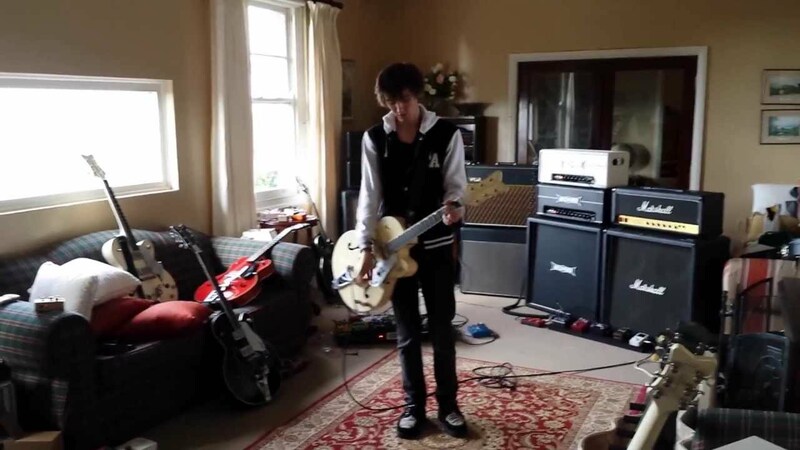 "Blake uses a 1986 Marshall JCM 800 2203 100-watt head with an effects loop mod into Marshall 1960A cabinet loaded with Celestions." 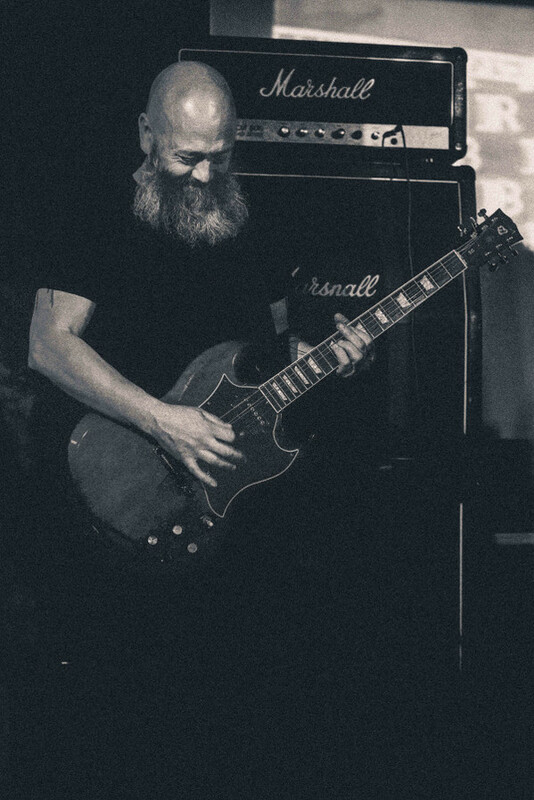 ''I had a Marshall JCM800 and a cabinet I bought second hand by some company I never heard of.'' Those were the earliest years of the JCM800 so that might have been (hardware-wise) a JMP800 with the JCM800 aesthetics (because the early JCM 800 models were the same as the JMP 800 ones). In this live you can see both guitarists (Aaron included) using JCM 800s. I'm not really sure if they're 2203s or 2204s, but still: I'm sure they're JCM 800s. The head are seen in this Instagram post. My 1st Marshall and 1st BIG British amp. Here comes the boom? Jim Marshall claimed this was his favorite Marshall model of all time. To this day I cannot understand why. but I digress... the channel switching 800s leave a lot to be desired, but if its between this and ANY JCM900, get the 800. You may be thinking that I got a bad unit or something, but I assure you that compared to some 's I've tried in stores since the turn of the century mine sounded downright good. None of them have any feel or touch responsiveness. I guess you don't need that with a footswitch to change sounds. The 80s and 90s were a strange time. We live in a comparative renaissance when it comes to tube tone and really all things guitar. Bask in it. In closing, you could use one of these early channel switchers to amplify your guitar in blues, classic rock or even certain hard rock and metal situations. I don't recommend it, but you can try it. If you can't afford a serious 800 get yourself a Laney GH50L or 100L. The older the better. While they are almost a dead-rip-off of a single channel 800 with some 'modern' features I choose to ignore, the build quality wasn't a knock on a 2203 and it got worse every year. It's a classic...nuff said. I only wish I got the 50 watt because I literally never use this thing anymore seeing as I never have the opportunity to crank it which is what it was built to do and it doesn't sound right at low volume. try pulling 2 tubes (the inside pair) and running at half impedance (eg amp set for 8ohms into a 16ohm cabinet), this should knock you down 2 or 3 dB... also consider using speakers that are mid-to-low efficiency to shave a few more dB... original greenbacks with medium and small magnets were only rated for 96dB or less and really helped tame in the plexis of the era. The speakers you have are pretty efficient and the quad box will project pretty darn well. I have to try that! I still won't bring it to my apt because it's too big but even on the rare occasions the I do play it back at my parents house I NEVER crank it like I used to in high school. I got a H&K TM18 for my apt. It has the power soak feature which is SO DOPE for sound management purposes. If I put it on 1 it has the same sound as it does at 18, just at a volume that my neighbors won't call the police on me for. Plus it has the red box out which I use too running directly into my Apollo. It actually sounds much different than it does out of my cab because it's modeled to sound like micing a 4/12, which I agree it does and sometimes I want that sound, but I've also come to love the sound of the head through my 110 cab so sometimes I mic the cab with an SM57. I just realized I should probably add my recording equipment to Equipboard too huh? I'm new to this site if it's not already painfully obvious LOL.